In addition to providing you with an overview of your shared expenses, your 2houses financial space displays the child support payment date and amount. 1) First, click on “Finances” on the upper menu, then “Child support” on the black menu below. Finally, click on “Define the child support“. 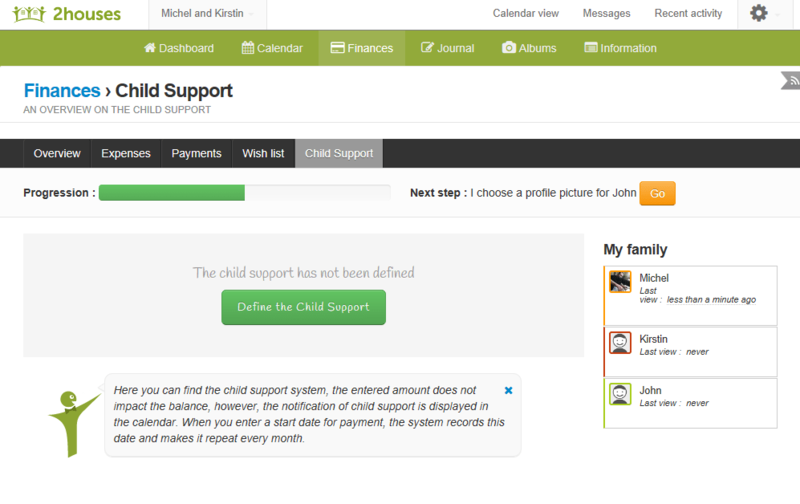 2) Now click on the parent that pays child support, enter the amount and the date of the first payment. When you’re all done, click on “Save“. 3) The child support is now all set, and displayed in the Child Support menu in your financial space with the payer, the amount, the date of the first payment and the date of the next payment. 4) Once the child support has been added, it’s displayed in your calendar, every month on the date you’ve entered (e.g. here May 1st). You have now added the child support to your financial space and to your 2houses calendar! Your financial management is now easier than ever before!